Just how rotten can the liberal culture of death be? Imagine your loved one dying in bed from terminal cancer, and callous leftists sending messages of hate on social media saying he can’t die soon enough! 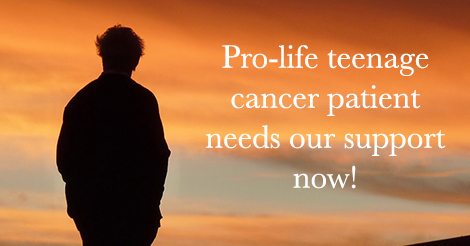 It’s heartbreaking to see people so cruel as to insult a terminally ill teenage cancer patient who is enthusiastically Pro-life and to wish that he were dead simply because he’s Pro-Life. Jeremiah Thomas is a 16-year-old from Texas battling cancer and recently spoke with Texas Governor Greg Abbot through Make a Wish Foundation. What did the dying teenage wish for? Not a new TV or car, or a visit from a movie star or a sports figure. He asked to put an end to the killing of innocent children through abortion. We want to show Jeremiah a warm support in face of all the hate he has been receiving. Please send 16-year-old Cancer Patient Jeremiah Thomas a Letter of Support! Although to cancer is deteriorating his health, Jeremiah’s high spirits couldn’t be healthier. Let us show him a great support for and encourage him to remain steadfast and never, never back down in face of the culture of death. Thank you so much for the pro-life work you are doing. Your wish to see abortion abolished is truly inspiring, especially since not even cancer is stopping you from making that happen. In response to the horrible, callous, leftist comments made against you on social media, I want to offer you my support and continual prayers. Jeremiah, you are an inspiration to me.